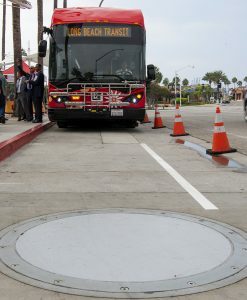 The city’s battery electric bus fleet will now be able to charge on the go after Long Beach Transit unveiled a wireless bus charging station outside the Long Beach Convention Center Thursday morning. Wireless electric charging will allow buses that dock at the Pine Avenue station between Shoreline Drive and Seaside Way to juice up while idling. 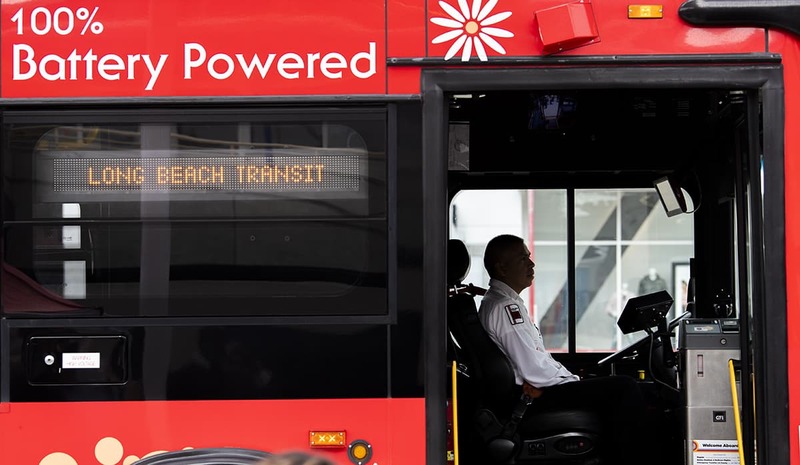 It’s anticipated that the city’s fleet of 10 battery electric buses, all of which are dedicated to the Downtown Passport route, will be able to use the charging station to partially recharge their batteries in about 15 minutes and extend their drive time. The charging station is part of pilot program that Long Beach Transit will monitor over the next year to assess whether charging stations should or could be expanded beyond the convention center. Mayor Robert Garcia, Los Angeles County Supervisor Janice Hahn and other officials were on hand for the ceremony and expressed hope that the station was a step in the right direction for the city as it could tries to advance its goals of running a cleaner bus fleet and becoming a greener city. Garcia said the investment in transit is necessary and added that transit needs to be expanded in the region. The charging station was originally approved by transit’s board of directors in July 2016 at a price tag of over $1.4 million dollars. Cost overruns eventually pushed the total cost of the project closer to $1.6 million. The cost of the charger itself is about $926,000 with grant money funding its purchase. But McDonald said the actual cost of the charger and installation could be much lower in other parts of the city when compared to this project, which had deal with the level of development at the convention center and navigating around the existing utilities to successfully install the charging station. In theory, he said, similar charging stations could cost less if installed at different points across the city. Utah-based WAVE (Wireless Advanced Vehicle Electrification) Inc. installed the charging station outside the convention center, adding to its portfolio of agencies that includes the Antelope Valley Transit Authority, Monterey-Salinas Transit, Central Contra Costa Transit Authority and the Utah Transit Authority. Long Beach Transit approved the purchase of its first battery electric buses in April 2015 in a $11.7 million deal with Build Your Dreams (BYD), a Chinese firm that maintains a United States presence, that added 10 new buses to the city’s fleet of nearly 250. Since then the agency has yet to add to the electric part of its fleet but has plans to purchase more electric buses as grant money becomes available. The city’s fleet uses the 40-foot version of BYD’s bus options which normally average about four hours for a full charge. The booster charge outside the convention center will take about 15 minutes and will take place a few times per day on average for each of the city’s ten electric buses. The boost will extend the life of the battery by a handful of miles each time but if transit were to expand the pilot program to a point where buses could stay continuously charged there is a chance that electric buses currently deployed along the Downtown Passport route could be placed on other routes. Battery electric buses have been shown not only to get produce less emission than their diesel or compressed natural gas counterparts, but also to get more mileage. A January 2016 report published by the National Renewable Energy Laboratory which studied battery electric busses in the Foothill Transit area, which serves Pomona and the San Gabriel valley, and how they compared to CNG buses. The report found that battery electric buses on average outperformed CNG buses by getting about four times the diesel gallon equivalent in fuel economy. Battery electric buses got went about 17.48 miles for every 4.51 miles traveled by a CNG bus when adjusted for the equivalent diesel miles per gallon. The buses that were part of the Foothill report were designed by the South Carolina based firm Proterra, a competitor of BYD. It’s wireless chargers were able to give its 35-foot buses a full charge in about five minutes.